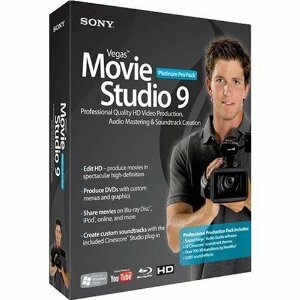 Sony Vegas Movie Studio Video editing, audio production, and DVD authoring come together in a single, powerful solution. Vegas Movie Studio Platinum software has everything you need to produce high-quality movies, corporate videos, wedding DVDs, and more. Easily edit video in almost any format including high-definition HDV and Sony AVCHD. Advanced tools for video compositing, color correction, and surround sound mixing help you achieve feature-film results in your home studio. And with integrated DVD authoring and multiple export options for online posting, you can deliver projects however you or your clients desire.